We now have shacks out on the ice at Horners Landing. We are taking reservations now for fishing, starting on wed. the 23rd. 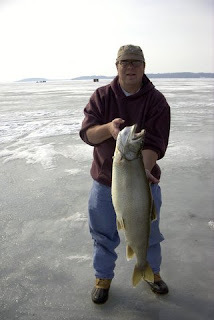 Fishing for lake trout in 80 to 100 ft of water. Today the rest of Big Green Lake froze over. We now wait for the ice to thicken up. The eastern 1/3 of the lake is ice covered with small open holes yet. The rest of the main lake is still open. of this week This is what we need. 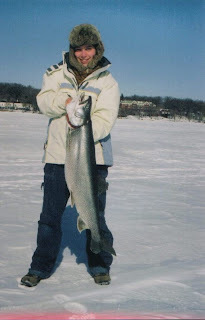 since 1972 that we can use minnows to fish deep water trout . THE MAIN BODY OF BIG GREEN LAKE IS STILL OPEN. -We have ice on the bay in town and beyers cove. ---This is allowing for some excellent catches of blue gills and small perch. -The main lake is ready to freeze, the water is cold. We just need a blast of cold weather.